Oops, I did it again! Chilean style! No, this post is not about a new remix to Britney Spears song “Oops I did it again”, it is instead about two Chilean wines from the Colchagua and Central Valley’s. 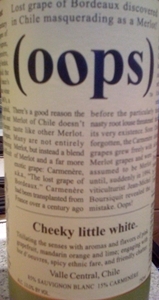 The other night I popped the 2008 Oops Cheeky Little White Sauvignon Blanc and the 2007 Oops Spicy Splendor Carmenere. Both of these varietals were of some of the biggest movers from Chile up twenty and twenty-three percent respectively. According to Rob Bralow of RF Binder and Wines of Chile: “Overall, Chilean bottled table wines increased by 2% in 2008, especially in December where imports of Chilean bottled table wines increased by 25% over December 2007. Most other countries saw a sharp decline in 2008.“ I would imagine that this in part because of the economic decline in the last and first part of this year here in the US and the incredible value that wines from Chile offer. This a nice Sauvignon Blanc, very reminiscent of SB’s from New Zealand and may be a nice alternative for people who like that style as the NZ SB’s prices have been on a steady incline. That isn’t to say that there aren’t great values from New Zealand as well. The nose on this wine was ridiculous, jumping out of the glass with classic Sauv Blanc aromas. I think the wines only down fall was the finish as the acidity fell off at the end after being so present up front. I am starting to see more and more 100% Carmeneres pop up in wine shops and this another good example of what can be done with the varietal. The people at Oops weren’t lying about this wine being spicy, it was loading with black pepper notes as well as black pepper spiciness. Great dark fruit aromas on the nose and palate with nice earthy hints of leather and spiced meats. Again a great value at $12. Casa Silva is currently owned by fifth generation family members thus the name of the wine, Quinta Generacion. Mario Silva currently leads the efforts now that his ancestor and French wine pioneer Emilio Bouchon started in 1892. Prior to 1997 Casa Silva was primarily selling their juice in bulk before they decided to revamp their wine program and went to an estate bottling program that has brought them various acclaim. 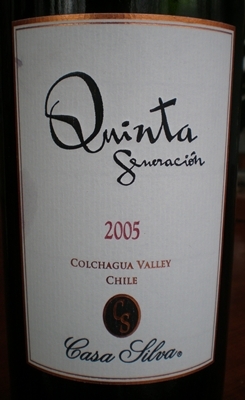 Coming from the Colchagua Valley in Chile the 2005 Quinta Generacion is made up of 35% Cabernet Sauvignon, 25% Carmenere, 25% Syrah, and 15% Petit Verdot. All hand picked and presorted before de-stemming the wine was aged for 13 months in new French Oak. This is a super solid blend that is ready to drink now and at $25 isn’t a bad price for the quality it delivers. I had it with a casserole filled with veggies and cheddar and goat cheeses but it would work well with various meat dishes. Although a bit pricey to not pair it with a meal and just treat it as a “cocktail” wine, it is smooth enough that you could enjoy by itself. Give it a whirl and let me know what you think. This was a very nice wine and it paired well with our broccoli risotto. I am not sure why I was picking up some heat on the wine although at 14.5% alcohol it is on the high side, I have definitely had higher with no heat to speak of. Other than the heat issue, the wine was very well balanced but definitely filled with lots of mature dark fruit flavors. I feel with the smooth tannins and round mouthfee, combined with the great fruitiness of the wine, it would do fine if you chose do drink it on its own.